Despite being role-playing for over a decade, and Sonic Role-Playing for around half that time, one thing I don't have is a definitive Sonic OC for myself. Skye Prower has sorta taken that role. But I felt it was time to have someone else, so here we are. Still keeping the first name of Skye though! I have had art done of her, but this version isn't quite finished yet. And as well as the profile, I've even done a script for an introduction adventure for her. 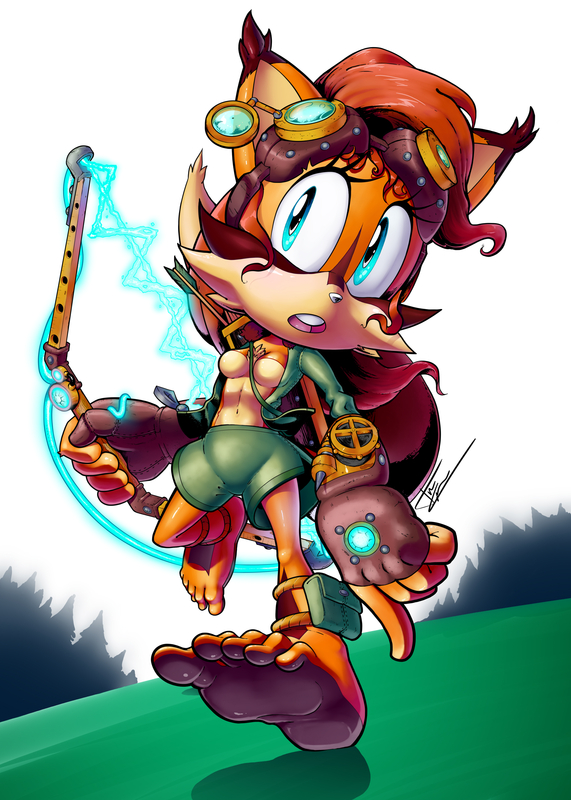 Skye is slightly shorter than the average Mobian, standing between the fox and lynx of her mixed heritage. She mostly resembles a fox, however she has the same face markings as a lynx. Her ears are longer and thinner than a foxes (or thicker and shorter than a lynx’s) and end with the same dark tufts as a lynx. Skye’s fur is a gingery orange colour, while her hair is a slight shade darker and redder. It reaches down around her mid back, mostly straight with a very slight wave in it. She has a single thick front fringe, though it’s slightly messy and sticks out in bits. As she usually has her goggles pushed up on her forehead, this keeps her fringe off her face. Her eyes are a turquoise colour, as are the crystals, force fields, and her magic. As well as her gauntlets, goggles, satchel and quiver, she wears a dull green jacket with a darker green trim. Usually open, but closed depending on the weather (and the censors!). She also wears a pair of shorts in the same colours. Skye goes barefoot. Powers/Abilities: Skye’s abilities, such as speed, agility, resilience, intelligence etc, are all above the Mobian average, but not by any significant degree (With the exception of her common sense which can be lacking). For example, if abilities were rated on a 1 to 10 scale, with 3 being average, and 9 being say Tails’ IQ or Mighty’s strength, Skye would have 4 and 5’s across the board. Slight Magic – Skye has a very slight magical talent, able to manipulate it to create a few small sparks, but that’s about it. She could maybe create a constant light if she focused. Close combat– With her natural abilities and her gauntlets, Skye is capable in close combat. But she lacks any real skill in fighting, so a skilled opponent would not find her a challenging foe. Artificer – Her main ability. Skye is able to use prepared crystals to store some of her magical energy, and then use these crystals as a power source. And she became quite skilled in building small/medium inventions using these power crystals. However, being magic, the power can be unstable, and these devices could have side effects, have a chance of overloading, or simply not work. The exception being the devices that produce energy fields, as Skye has now worked out (most of) the kinks in those systems. Because of the unusual power source, and the fact that Skye doesn’t actually know the basics of electronics, these inventions of hers would not work with any regular power source. Weapons/Equipment: Bow – Her main weapon. This bow has an energy forcefield ‘string’ and can either create its own force bolts (which loose power the further they travel) or can fire regular arrows if needed. Goggles – A pair of goggles used when Skye’s working on her inventions, which she wears pushed up on her forehead the rest of the time. While they are regular work goggles, the right side has an attached lens which can fold down to assist Skye in aiming her bow. Multitool – A penknife by any other name, which can project small forcefields to act a blades, screwdrivers, clippers, files, etc etc. Satchel – A simple tool satchel, which hold Skye’s tools, spare power crystals, and a few other gadgets. Most are kept inside the satchel, but her Multitool is slotted into a pocket on the side. Quiver - A small quiver worn on her back with a handful of arrows that have different specialised heads. Personality: At first Skye is very shy and awkward around those she doesn’t know. However, around her friends, on her own, or if anyone shows even the slightest interest in her inventions, Skye is very enthusiastic and talkative. She is also slightly naive about how the world operates. This also extends into wanting to be a hero like others, but her enthusiasm can get her into trouble. However, she will defer to those who are more knowledgeable or skilled than she is. The exception is regarding her inventions and experiments, where she will be pretty stubborn about what she is doing, moreso if there is any implication that what she is doing is risky. While she enjoys puzzles, Skye can miss an obvious solution while trying to work on a more complex one. She can also panic if out of her depth without someone to help her. She also has a slight temper, which is under control most of the time. Unless someone makes fun of her inventions. Skye’s home was an isolated forest village, where the inhabitants had chosen to live a ‘technology free’, almost tribal lifestyle. They weren’t isolationists, at least, prior to Dr Robotnik/Eggman, and would welcome in other Mobian’s who wished to live a technology free life. Most of the inhabitants were Lynx’s, but many other species were present. While they don’t have any technology, many of the Lynx’s have developed a talent for magic. A unique aspect her is the storage of magic in small prepared crystals, almost creating magical batteries. These tend to be used to enhance spellcasting, or simple illumination. Skye was born with a slight aptitude for magic. She could fill a crystal, and cast a simple light spell, but that was it. But what Skye was drawn to were the bits and pieces of technology that sometimes were found around the village. They were almost always broken, but Skye developed a fascination for them, wondering how they worked. At first, the villagers allowed her to collect them, seeing it as a phase she would grow out of. But Skye didn’t. She spend more and more time with her collection, taking them apart and trying to understand how they worked and put them back together. Then one day, she realised what was missing was a power source. She charged up a crystal, and with some work, was able to get the device running again. Proud of what she had done, Skye showed it to the village. Only to be cast out, for using the village’s technique to fuel the very technology they despised. Now, Skye has been left on her own to wander, and to build. She has managed to create more devices, and she is starting to learn about the wider world she’s found herself in. The one thing she has learned is about the various heroes who help defend the world from evil, like something from the campfire stories she listen too as a child. And Skye wants to be one of them. For anyone who wishes to read it, her is a link to Skye Crystal Origins - Heroes and Monsters.